Vanilla bean ice cream with ribbons of peach puree. 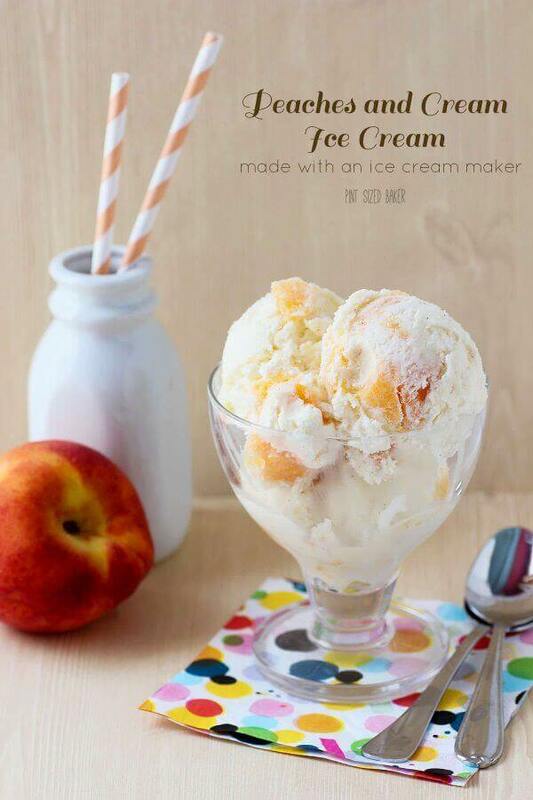 This peaches and cream ice cream is a fabulous treat for a summer afternoon. My local peaches are so good! They are sweet and juicy and we love them. Well, we kinda have a love/hate relationship with them. You see, we just can’t get past the fuzzy outside, so we don’t eat them “raw” very often. I’ve been baking away with them and I love them pureed in this Peaches and Cream Ice Cream recipe. I wanted to make some Peach Ice Cream, but I wanted the peach to be separate from the ice cream. I was looking for a ribbony effect of the peaches and that’s just what I got when I folded in the peach puree instead of mixing it thoroughly into the ice cream. So, I decided to make a basic Vanilla Bean Ice Cream and then add in some pureed peaches. In order to keep the two separate, I froze the peach puree in its own bowl first then I added it to the cream base. You can almost think if it as a fruit granita meets vanilla ice cream. Yes the peach has an icy texture but I kinda liked that. It was a bit different in my mouth. There was some peach to eat and savor while it melted on my tongue. 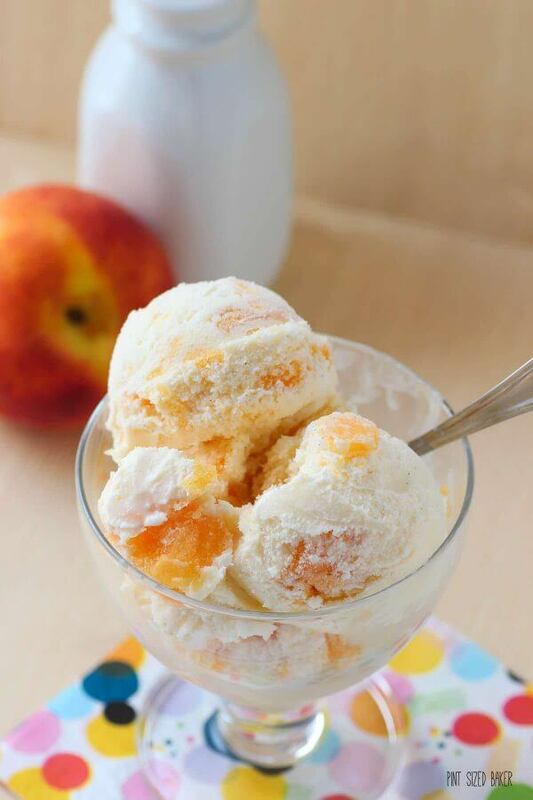 If you’re a peach lover, this ice cream is perfect for you! Want a quick way to remove the skin from the peach? Score an X at the bottom on the peach. Boil enough water to cover the peach. Drop the peach into the boiling water for 1 minute. Transfer the peach to a bowl of ice water and the skin should come right off. If the skin sticks, simply put it back into the boiling water for another 30 seconds. Got a lot of peaches from the farmers market? Did you know that peaches can also be added to a savory dish? Try this Peach Quinoa Salad as a side dish. Add them to this BBQ rubbed pork chops and peaches recipe. Try a new pizza flavor with this Ricotta Pizza and Peaches. 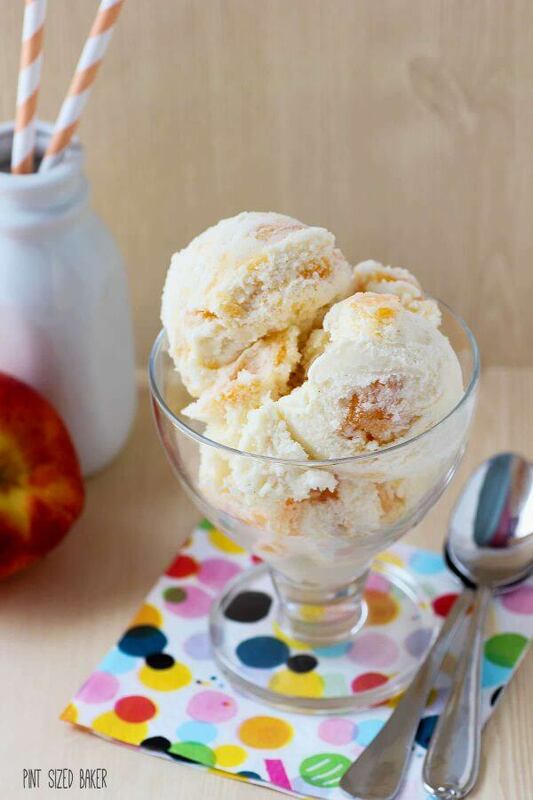 You'll go ga-ga for this Peaches and Cream Ice Cream for dessert. Sweet, homemade Vanilla Ice Cream with with Peach puree mixed in. It's amazing! In a KitchenAid Mixer, whip eggs and sugar until pale yellow and slightly frothy. Add in the milk and cream and whip for 30 seconds. 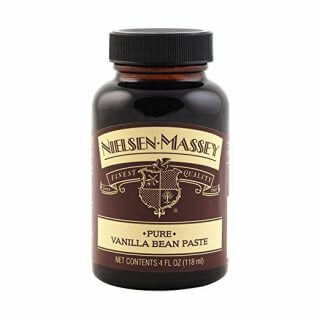 Add in Vanilla Bean Paste and stir to combine. 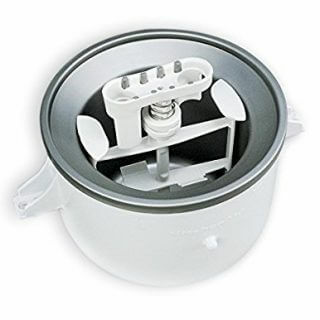 Add to an Ice Cream Maker and follow the manufacturer's instructions. Transfer to a freezer safe bowl and press plastic wrap on top of ice cream. This keeps ice crystals from forming. Remove the skin from the peach and puree it in a blender, food processor or hand mash until thin. Place it in a bowl and freeze for six hours. Remove ice cream and peach puree from freezer. Gently break up peach puree with a spoon and add to the ice cream. Fold the peach into the ice cream. Do not over mix the peach in. Once all the peach is incorporated, place plastic wrap over top and return to freezer overnight. Enjoy on a hot summer afternoon. 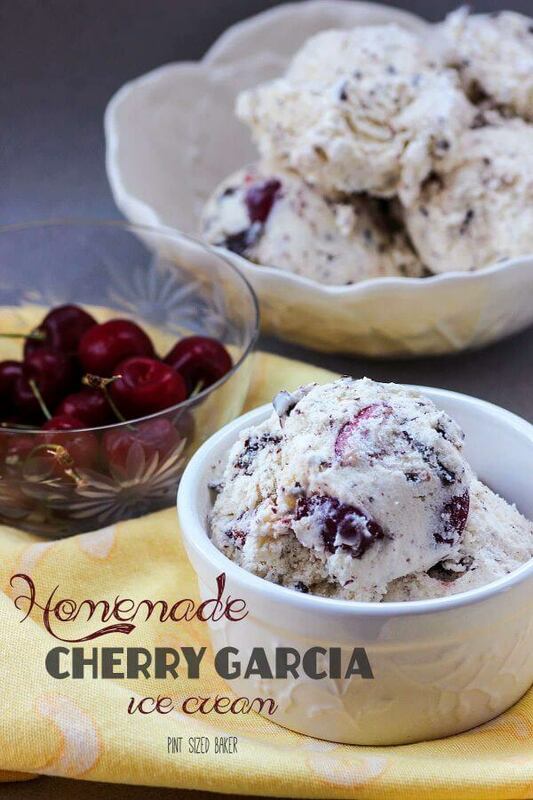 All your homemade ice cream is soooo good!!!! To bad I just don’t have your talent!! Gorgeous photos!!! Dang I love ice cream. This is like the 5th ice cream recipe I’ve pinned this morning. If I make all these recipes I will either be 600 pounds or I’ll need an ice cream shop! Lol… Just make one per week! That’s what I do. This sounds so refreshing and looks so delicious. I came across your blog on Share Your Creativity. Thanks for stopping by. I enjoyed the ice cream! Your photo looks amazing! The only peaches we have around here are imported, but I’d love to try this with mangoes…we’ve got a huge tree full in front of the house. You’d better believe I’ll be right over to check out your chocolate brownie ice cream recipe too. Yum! Thanks for sharing, Karyn. I’m visiting from Marvelous Mondays. Mango sounds good, too. I grew up with a Mango tree in our yard. My Mom hated it – called it a “trash tree” because of all the rotten mangoes it would drop. On my other blog, Pint Sized Baker, I made these super easy Mango Gelees. Check it out here – https://pintsizedbaker.com/2013/07/mango-and-yogurt-gelees-for-bloom.html Enjoy! what is better than peach ice cream in summer? This looks delicious, Karyn! The color of the peaches just pops out! Pinning and sharing on Facebook and Twitter. Thanks for sharing at Marvelous Mondays! Thanks so much Julie! I was hoping to see the peaches and the cream separately. I have peach basil ice cream in the freezer but now I want to make this as well! I’ve been making lots of ice cream lately, but not yet with peaches. 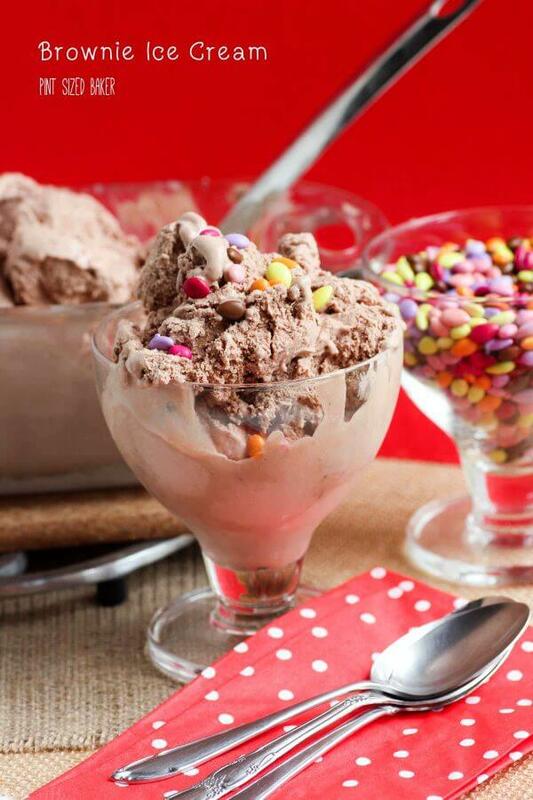 This ice cream simply looks fantastic!! I liked the creamy vanilla and the sweet peaches. Separate and together. Give it a try. I LOVE anything with peaches! Are local orchards have the best too! Thanks for sharing the recipe! Aren’t farm fresh peaches the best? I love them! We’d love to have you stop by & link up at our SUPER SUNDAY Link Party, live now through Tuesday evening! Thanks so much for stopping by. I really enjoyed the ice cream. Heck, I don’t think there’s an ice cream I haven’t liked. Thanks Cheryl. As soon as I saw the pingback, I headed over and linked up again! I love peaches and cream and just got an ice cream maker. This recipe is on my list. What do you mean you “just” got an ice cream maker? I love mine! I hope you love yours as well. I much prefer real ice cream over the no-churn stuff. I know it’s hard to believe but I finally got one as a birthday gift this year. It hasn’t been out of the box, but that needs to change! This looks sooooo good! I love the idea of granita and ice cream together. Yum! It was great! I think all fruits can be done this way. This ice cream sounds super yummy! I love the big chunks of peaches peeking through! This will be high on my list when I get my first peaches from the farmers’ market! Gorgeous ice cream! 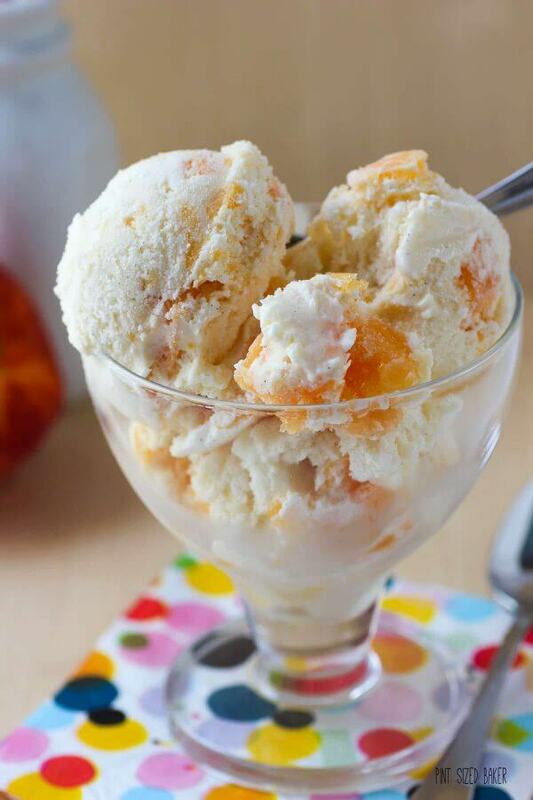 I love the bursts of peaches in the ice cream instead of it all mixed in together! Oh my word! This looks so yummy! 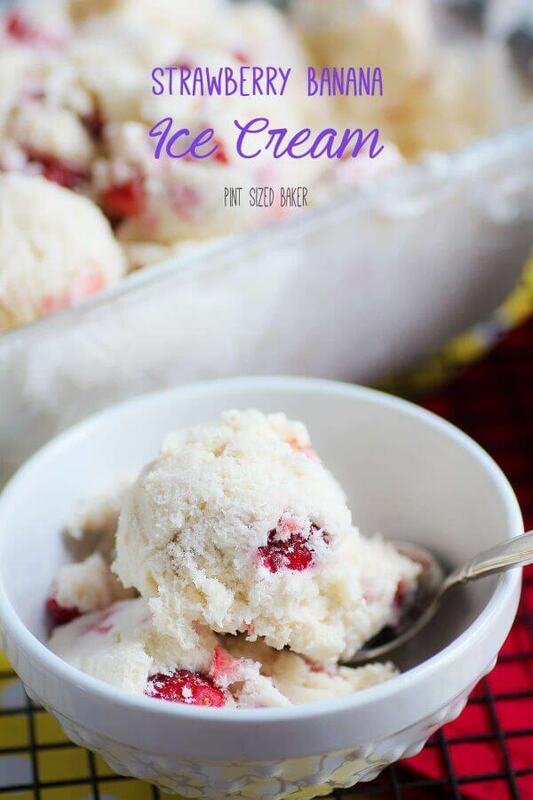 My family loves homemade ice cream… and they really love it with mix -ins. Can’t wait to try the recipe. Thanks so much for sharing it at last week’s Tips & Tricks party. I hope you’ll link up at this week’s party, too? It just went live… 🙂 Hope to see you there! Thanks so much! It was a great ice cream! Hands down, this is one of my favorite summer ice cream flavors! It’s perfect “lazy afternoon, sitting in the sun, watching the kids play in the splash pool (grandkids for me), eating ice cream” thing! Love it! Peaches and cream for the WIN! Sounds like a great way to enjoy the afternoon! Hi. This is gooorgeous! Hopefully to make one. We have no peach in my country.. If we find one, it’s 10$ each… Lol. And I’m Just curious. Do I not need to cook it even if it has eggs in it? This ice cream base is not cooked. The cooked version is more of a custard and it’s whats known as a Creme Anglais base. The freezing of the eggs will do just as good as cooking them, or you can try to find pasteurized eggs instead. Sorry you can’t get peaches where you are. You can used canned peaches if you have that.